Mr. Floyd Davis was a mail carrier in Overton County many years ago, and made a lot of friends throughout the county. When he began carrying the mail, he did so on horseback, and later drove a car with a rumble seat. Many children along his route often received candy as a special treat from Mr. Floyd as he delivered the mail in the rural areas of Overton County. One family living in the Hardy’s Chapel area considered him an especially good friend, and it was Mr. Floyd who had to deliver a telegram to this family that changed each of their lives forever. But before we go any further, some background information is necessary. We’ll begin with what I think was a very unusual wedding ceremony. When Robert Hooks of Hilham, whom everyone knew as Bob, and Cora Dickerson, from Hardy’s Chapel, decided to get married, they set out on foot from Cora’s parents’ home to find a justice of the peace to perform the ceremony. Not long into their journey, they met up with the very person they were looking for, and as the young couple stood on the path they were taking through the woods to find this person named Bub Myers, he performed the ceremony right there. Thus began a long and happy married life together, but one that also included some hardships along the way. 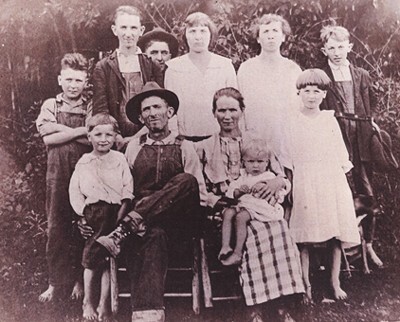 As the years went by, a total of twelve children were born to Bob and Cora Hooks. 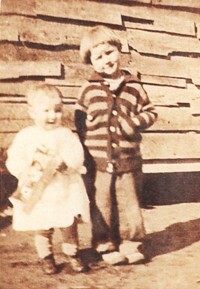 Their names in the order of their births are as follows: Mary; Martha; Overton; Eugene; Walter Thomas; Benton; Henry; Edith; Willie; Columbus; Myrtle; and Sylvia. The Hooks family lived in the Hilham area until their son, Columbus, was around two years old. They moved then to the Hardy’s Chapel community where they remained the rest of their lives. Myrtle described her parents as the happiest people she ever knew. She said that while the children in her family were growing up, each had certain jobs to do, and sometimes the work was hard, but they always had a lot of fun too. She said there was a whole lot of love in the family and that’s what count the most. Myrtle remembers going to church services at Crawford’s Chapel school. She said her dad would load all the children in a wagon pulled by two mules. He and Cora sat on chairs in the front of the wagon, and the children sat of quilts that had been spread out in the back of the wagon. A car was something that the Hooks family never owned. Going to school at Crawford’s Chapel is another of Myrtle’s memories, and one rainy day in particular stands out in her mind. She said it was simply pouring the rain that day, and because it was raining so hard, her father had Henry to take her to school on a mule. Before they arrived, Myrtle slid off the mule, and landed in a mud puddle. She was soaked not only by the pouring rain, but then completely after landing in the mud puddle. But she went on in the classroom, and the teacher had her to sit near the wood stove until her clothes dried. The Hooks children all grew up like most who lived in this area did during that period of time. The Christmas holidays always included fruit and candy, and sometimes a toy would be given too. But not long after Columbus reached the age of 18 and was drafted into the army, this family endured an experience that even today Myrtle cannot relive without tears. 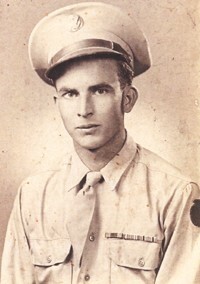 When Columbus left for his tour of duty with the army, he was sent first to Ft. Oglethorpe, Georgia, and then on to Ft. Jackson, South Carolina, where he received his basic training. While still in basic training, Columbus let his family know he would have a few days of furlough, and would be coming home for a short visit. Even though he hadn’t been away too long, the family was excited and happy at the prospects of his getting to come home. Special preparations were made in anticipation of his visit, and finally, the day he was expected home arrived. But as that day passed and nighttime came, there was no Columbus. The family went on to bed that night thinking he had been delayed, and that when they got up the next morning, they would find him fast asleep in this own bed. But that was not to be. Sometime later, they learned that instead of getting a furlough, his unit had been shipped out overseas. But the worst was yet to come. As the war continued, the unit Columbus served with struggled through a battle at Anzio Beachhead in Italy. It was there that many American soldiers lost their lives, and sometime after this battle had taken place, Mr. Floyd delivered a telegram to the Hooks home with some terrible news. Columbus was missing in action. Needless to say, they were devastated. Many people who listened to short wave radios heard about those who were missing. Later the Hooks family would receive fifty-five cards and letters sent from people who didn’t even know them, but had heard by way of a short wave radio about their family having a loved one who was included in those who were missing. Days became weeks, weeks became months, and still no word about Columbus was received. In spite of what might have been considered by some as a hopeless situation, Bob Hooks cured a ham and put it away in a burlap sack, telling his family, "We’ll have this ham when Columbus comes home." The family never gave up hope. During this worrisome time, Mr. Floyd made every effort to keep the family posted on any possible news that might come from the army. Many times after completing his route, he would return to the post office to see if any news for the Hooks family had been received since he left that morning, something he didn’t have to do. So it was very fitting that when another telegram was received, Mr. Floyd took it upon himself to read it first so he could give the family some news they had waited for nearly three years to hear ... Columbus had been found alive. The mailbox for the Hooks home was a little distance from the house, and on the day the telegram came, Myrtle and Sylvia were there waiting as they often did, so they got to hear the wonderful news first. As soon as Mr. Floyd told them, they ran screaming to the house to tell their mother. When Cora realized what the girls were telling her, she leaped off the front porch of the house, which Myrtle told me was quite high, and together, they all ran to find Bob who was at the barn. Upon hearing the good news that his son had been found alive, he just sat down on the ground right where he had been working in the barn. Many tears were shed and much rejoicing took place knowing that Columbus’ life had been spared, and that one day soon he would be able to join his family once more. Once the news traveled, neighbors and friends gathered to share in the celebration that Columbus would be coming home alive! And the fact that Columbus had gone away did not go unnoticed by his black and white dog he called Spot. It was Spot who walked down the road with Columbus the day he left for service, and waited with him until his ride came by. Myrtle remembers how after Spot realized Columbus wasn’t at home anymore, he spent part of every day howling. She said each afternoon around the same time Spot saw Columbus last, he began to howl. He carried on so much, the family would sometimes become quite annoyed with him. But after his master returned home safely, Spot’s howling was never heard again. Columbus hadn’t been back home too long before asking, "Where’s Spot?" Columbus returned to the United States by way of a ship that docked in New York harbor. He got to Livingston on a bus, and was picked up by John Thompson, a neighbor, when he saw Columbus walking down a street in Livingston after he had gotten off the bus. When they arrived back at the Hooks home, Mr. Thompson announced to the family, "Look who I brought home!" Much of the three years Columbus served in the United States Army was as a prisoner of war. He told his family he had been wounded and had to walk two miles in the snow to the location of a doctor for treatment of his wounds. He suffered frostbite of both feet and his shoes had to be cut off him. He and some other soldiers one time successfully escaped from the Germans, and found a cave where they lived for three months before being discovered. They were able to make their escape because the train they were being transported on was bombed by the Americans. The cave they lived in for that length of time had three entrances, and when the Germans found them, all three entrances were covered, and they had no way to escape a second time. This time they were placed in a concentration camp where they remained until the war was over. Columbus’ weight dropped to 87 pounds while in the camp. But the owners of a farm where they were taken to work on while being held in the concentration camp were especially kind to him and the other soldiers. They gave them extra portions of food to eat, something they could have been killed for had the Germans found out about it. I’m sure this is only a tiny little example of the hardships Columbus and the other American soldiers serving with him were forced to endure while fighting to protect our country. Such things are unimaginable to those of us who have never experienced such horrors first hand. I was very touched by the love and compassion Myrtle showed while telling me the story of how her family made it through this hard time, and how they struggled to hang on to the hope that someday Columbus would return unharmed. She said that the ham her father put away until Columbus got home was the best one she ever tasted when it was served at a family meal celebrating his safe return. A few years after coming back home from service, Columbus married Liza Mae Allen, and they later had two daughters, Anna Hooks Webb and Marlene Hooks Hardison. Bob Hooks lived to the age of 85, and Cora died when she was not quite 97. Both Columbus and his wife are now deceased. The closeness of the family and their steadfast love that knit them together helped to bring about the happy ending of this chapter of my journal. Thank you, Myrtle, for sharing this story with me, and thank you also to Geraldine Stover for sending me in Myrtle’s direction. It’s getting acquainted with what I call the gentle people of the earth, folks like Myrtle, that make my searching for stories so worthwhile.